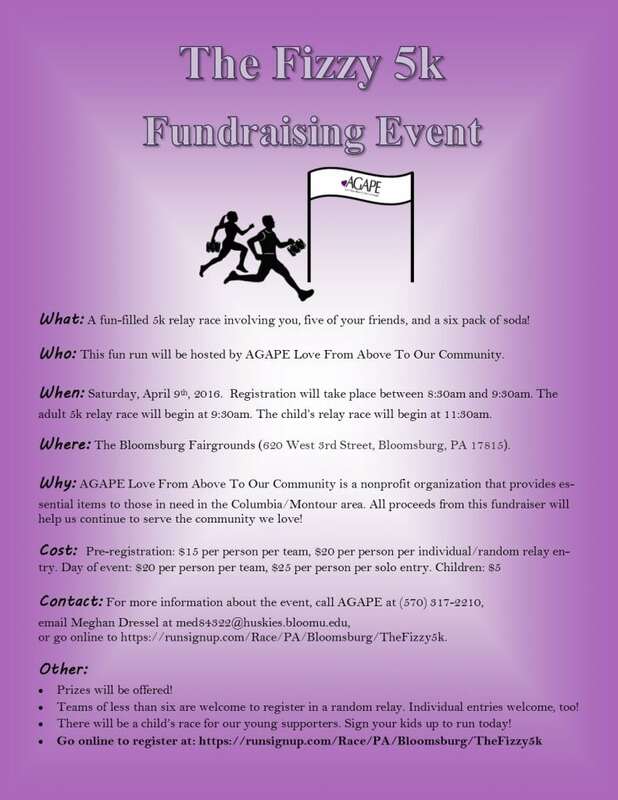 AGAPE in Bloomsburg is a non-profit that helps those in need with financial assistance, furniture, clothing, and food. They are hosting a Fizzy 5k Fundraising Event to raise money to help the community. The Fizzy 5k will take place on Saturday, April 9 at the Bloomsburg Fair Grounds at 620 West 3rd St. Registration will take place between 8:30 a.m.-9:30 a.m., the adult race will begin at 9:30 a.m., and the kid’s race will begin at 11:30 a.m.
All proceeds from the Fizzy 5k Fundraising Event will help us provide for the community. Participants can sign up with a group of six people total for the relay race. Each group will get one six-pack of soda that they have to run with. When one team member finishes their half mile and reaches the next person, they must take a can from the pack before handing it to their teammate and drink the soda. You don’t have to have a group however to participate; you could sign up by yourself or with some friends and just run or walk the whole race. There will also be a kid’s race in which each kid will get a water bottle and have to fill it up at certain stations set up along the track. The bottle should be filled up to the line drawn on it. This race will be shorter; the length depends on the age group. There will be food, t-shirts, and prizes. Runners and volunteers are welcome.